Do you think Islamic republic of Iran is qualified to be in UN Women's Rights committee? Do you trust them to judge women's rights violations? 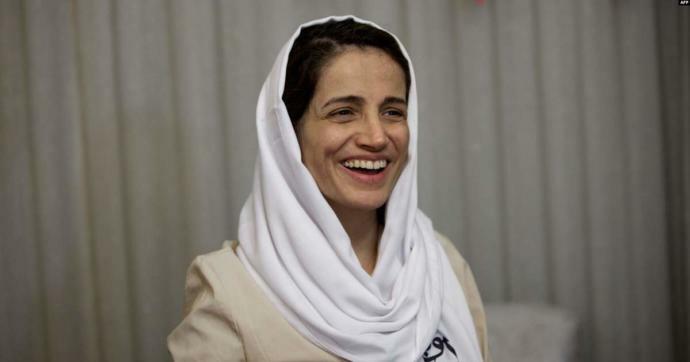 Islamic republic just sentenced Nasrin Sotoudeh, a human rights activist and lawyer, to 38 years in prison and 148 lashes (basically a life sentence because she's already 55). And that's after she already spent 6 years in prison. Why? Because she represented imprisoned Iranian opposition activists, including women arrested for appearing in public without Hijab. i actually live in Iran and it's ridiculous seeing that people around the world feel sorry for Iranian women because they have to cover their hair while we're struggling here everyday of our lives because of the stupid policies made by our own incompetent government and western governments. why do people just focus on women when everyone is suffering here. i don't expect you to believe this but men are having it much worse than women in Iran. the only reason you don't hear about it is because men don't get as much sympathy as women. Actually personally, I don't focus on Iranian women that much, even though it's a pretty important matter since they don't even have the most basics of rights which is to choose not to wear religious clothing if they want and expressing themselves in ways they wish. I actually know males (especially working class males) have it far worse than a lot of women in Iran because they are expected to work and feed an entire family while their economy goes downhill and for that, sometimes they have to work 3-4 jobs (and still not being able to have a decent life). And that's while their women stay at home. I also understand the frustration you feel and agree with what you said. The world (west in particular) is pretty obsessed with women's issues rather than focusing on both genders. It's a problem western males face too. But again, women's issues is one issue and must be discussed. I guess you could at least try to use westerners' obsession for it to make your voice heard. i believe that women's rights are being violated in so many parts of the world including Iran and i believe those need all the support they can get but the stuff that Iranian women are faced with isn't necessarily because of their gender. Iran is a weird country with so many double standards. what i mean is that the Iran women who are being treated unfairly and don't have much freedom are victims of social and financial equality not misogyny. Iran is a weird country in which you can do whatever you please as long as you have the necessary connections and wealth to keep you away from trouble. I see Iranian women get away with fraud and embezzlement let alone simply expressing themselves but it's not the same for women of lower social classes. so is this really about women or the crazy distribution of wealth in Iran? "what i mean is that the Iran women who are being treated unfairly and don't have much freedom are victims of social and financial equality not misogyny." "I see Iranian women get away with fraud and embezzlement let alone simply expressing themselves but it's not the same for women of lower social classes." Yeah. Recently I've been following the case of embezzlement surrounding Marjan Sheikh Al eslami, Mehdi Khalaji's wife (I don't know if you follow Iranian opposition's news). I know women higher in social status/class can and many times do almost as much harm to Iranian society as their males. "so is this really about women or the crazy distribution of wealth in Iran?" Yeah. I can also speak Farsi and been to Iran (I'm not Iranian). Not all of us are clueless. Though I wouldn't say people like me are more than a very tiny percentage in west. Many can't even point to Iran on a map. عزیزم، کسی نگفت به مردها "خیلی" بیشتر سخت میگزره. میگفتیم مشکلات ایران به مشکلات زنان خطم نمیشه و بسیار ریشه ای تر از اینهاست، که البته کاملا هم درسته. Riyadh is already in the U. N. Human Rights Council, so why shouldn't Tehran be in the U. N. Women's Rights Committee? Remember Saudi Arabia's Qassim Girls Council? I dunno man. Maybe because last time I checked UNHRC was a joke? Iran is a joke when it comes to women’s rights. They’re very strict and I’ve lived there before. But why isn’t changes being made? Because ridiculous feminists are till marching for rights in westernised countries. Smh. I agree. Do you speak Farsi? Do You Love Or Hate Politics? Why Do You Feel That Way Towards Politics? What's more important to you, money or culture? Is global warming real? Would you vote for Candace Owens for President in 2024 if she ran? Does this gif accurately describe modern day feminism in the west? Yeah yeah. It's just a tiny little dictatorship that stones women to death. Let's just include them. It's not like principles are important to us and credibility of an international body gets flushed down the toilet for those of us who actually believe authorities should lead by example. so i reiterate. the UN incorporates many nations that practice or in which human rights violations are carried out. the committee specifically has representatives whose purpose is specifically to improve conditions for women. so you could argue that those countries where women are especially victimized need representation on the committee above all else. saudi arabia is on the committee"
Countries aren't children and UN isn't elementary school, buddy. But everyone's entitled to their opinion. You hold yours. I would think being on the committee would open themselves up to being judged and held accountable. Honestly I don’t know how UN politics works, but while this seems like a stupid idea at first glance I think it might be beneficial in the long run. It won't be. We had that experience with UN commission for human rights which had to be replaced because it became too much of a circle jerk for bloody dictatorships. And the replacement is UNHRC which isn't any less of a circle jerk for "included" dictatorships that vote together. If they are part of it then they can be held accountable and explanation can be demanded. If they are not part of the committee you can't ask them, punish them or demand an explanation. They don't need to be part of a committee to be denounced, held accountable, or asked for an explanation and such. That just happens through resolutions that can be accepted by various institutions in the UN, such as the UN security council, UN general assembly and UN Human rights council. @tartaarsaus i am aware of that. But excluding them wouldn't help. It would further alienate them. Better give them a seat and then demand explanation. Yeah. Just like China, Venezuela, Saudi Arabia, and other bloody dictatorships that are held accountable in UN bodies like UNHRC which they are a part of, for their bloody human rights violations. @Glue-Sniffer sure. It's not like Iran is alienated by the West (except for the USA). 1. Iran barely ever gets any resolutions against them. So giving them a seat to explain never happens. It's better than north korea. Wouldn't you agree? Excluded from everywhere and yet somehow the worst country regarding everything. Iran is effectively alienated by the west. Not officially but effectively since the us holds all the cards and the other countries aren't real players. "But excluding them wouldn't help"
It would not give them a place of authority to judge other people in what they are not good at at least. "Better give them a seat and then demand explanation"
If only it was that easy, sunshine. Right now what's happening to UNHRC is bloody dictatorships abusing its power to attack their own shared enemies and make a mockery of the whole body. That's probably what happens to UN women's rights committee too. How exactly would North Korea being in UN committees improve them? And most importantly c) they have already got basically a maximum of sanctions based on their human rights violations. If they cared so much about not being punished, they'd surely improve their situation. Right? Oh wait, they haven't in spite of all the criticism of the world (chance to denounce, as you mentioned), all the sanctions of the world (like punishment that you bring forward) and the chance to explain. @Glue-Sniffer Iran effectively surely isn't alienated by the West. @tartaarsaus you don't know what you are talking about. Iran can't even get its oil money from the west because no banks are willing to work with iran. Iran is effectively alienated. Just another episode in the long sage of the UN having idiotic nations in the wrong positions. So @ OP you speak Farsi and used to live here but your actually Swedish? How? I don't really see any foreign people live here considering, apparently there used to be foreign people living here before the revolution as elders say... but i dont really see them now. I'm a little confused because it says you're from Sweden, but you use "here" as if you're in Iran. So clarify that. 1. I'm not Swedish, I'm living here for now. 2. My father worked in the German embassy in Iran for a few years. And of course you don't see many foreigners in Iran because there aren't many. Foreigners I knew were adults and kids from our embassy and some from Austria's. Lol no. Just like Saudi Arabia isn't either. Both of the countries rank in the lowest part of lists of the typical ~170 countries you usually study when it's about equality between the sexes. I think we need to see people's perspectives from multiple directions, also from people who maybe oppose it. The world is the place of all of us, not just of some western feminists. Well it doesn't mean I have to accept wife beating as something okay like it is in those countries. Women get prison if they are raped like its their fault. Kinda fucked up. Islam and human rights (let alone rights for women) are mutually exclusive. Islamic republic of Iran is qualified to be in UN Women's Rights committee? I find that ironic and humorous and no I don't trust them, at all. Haha. UN back at it again. Okay wow... Glad I don't live there. Islam destroyed our country. We gonna make a revolution and remove Islam and all barbar arab culture! Long live Real Persian culture! Why I am racist to my own race and why religion should be separated from the law Why I am a Royalist My (unasked for) and unpopular opinions A Justification for the Criminalisation of Tobacco! Higher Education: just add water.. or alcohol. Home > Society & Politics > Do you think Islamic republic of Iran is qualified to be in UN Women's Rights committee? Do you trust them to judge women's rights violations? Does it make a woman strong if she dates a homeless guy?